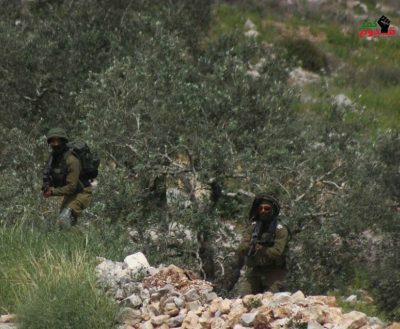 Israeli soldiers attacked, Friday, the weekly procession in Kufur Qaddoum town, east of Qalqilia in the northern part of the occupied West Bank, and injured five Palestinians, including a child and a cameraman working for Palestine TV. 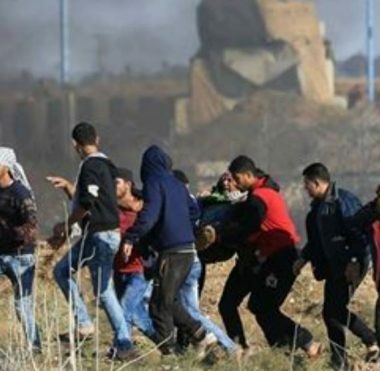 Morad Eshteiwi, the media coordinator of the Popular Committee against the Annexation Wall and Colonies in Kufur Qaddoum, said the soldiers resorted to the excessive use of force and fired dozens of rubber-coated steel bullets, gas bombs and concussion grenades. 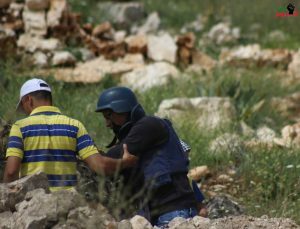 He added that the army injured five young men, including Palestinian TV cameraman Mohammad Enaya, and a child. Two of the wounded Palestinians were rushed to Darwish Nazzal hospital, in Qalqilia, and the rest received treatment by local medics. Furthermore, the soldiers invaded and ransacked many homes, and attacked several Palestinians. Eshteiwi stated that the Palestinians will continue to protest the ongoing illegal Israeli occupation, its colonies and Annexation Wall, and will fight for their legitimate rights, until liberation and independence, and establishing a sovereign Palestinian state with Jerusalem as its capital. He added that the Palestinians will not surrender to this occupation, and will continue to resist it, and reject the illegal US recognition of occupied Jerusalem as the unified capital of Israeli, in direct violation of International Law and various United Nations and Security Council resolutions. The Palestinians, accompanied by international peace activists, have been holding weekly processions against the illegal Israeli colonies and the Annexation Wall, and demanding the army to reopen the town’s main road, which was blockaded fifteen years ago, to enable easy access for colonialist settlers driving to and from Kedumim illegal colony, which was built on private Palestinian lands. We have never rejected political negotiations with Israel, Palestinian President Mahmoud Abbas said yesterday. Speaking to reporters in a press conference in Ramallah with his Bulgarian counterpart, Rumen Radev, Abbas stressed that the Palestinian Authority (PA) has always been ready to take part in negotiations with Israel, warning that “it [PA] won’t accept solutions outside the framework of international legitimacy”. “We want a two-state solution — an independent and sovereign Palestinian state on the 1967 borders, with East Jerusalem as its capital,” The Times of Israel quoted Abbas as saying. “This city, East Jerusalem, should be open to all religions, Islam, Christianity and Judaism, which will practice their religious rituals freely,” he explained. Addressing the internal issues with Hamas, the Palestinian president noted that “they [Hamas] must immediately hand over everything, first and foremost security, to the Palestinian Authority,” referring to the reconciliation agreement between Fatah and Hamas that was signed in Cairo in October 2017. “If Hamas does not hand over everything to the national unity government, it will bear the consequences for failing the Egyptian efforts to achieve reconciliation,” he warned. Last week, Abbas decided to take “national, legal and economic measures” against Gaza following an assassination attempt against the PA Prime Minister Rami Hamdallah in Gaza. Abbas held Hamas responsible for the attack. Palestinian student leader Omar Kiswani is on indefinite hunger-strike in Israeli jail, protesting his detention, torture and interrogation without charges. According to reports, citing an update from the Palestinian Prisoners’ Society (PPS), the head of the student council at Birzeit University started the hunger strike on 19 March. PPS lawyer Ma’moun Al-Hasheem said Kiswani informed an Israeli judge about his hunger strike, and the reasons for holding it. In addition, the report added, the court banned Kiswani from meeting with his lawyer until 26 March to allow for continued interrogation without legal representation. Kiswani was snatched from Birzeit University campus on 7 March by undercover Israeli occupation forces pretending to be journalists, in a violent raid that has prompted widespread condemnation.